The goji berry is a bright orange-red berry that comes from a shrub native to China. In Asia, goji berries have been eaten for generations in the hopes of living longer. Over time, people have used goji berries to try and treat many common health problems like diabetes, high blood pressure, fever, and age-related eye problems. 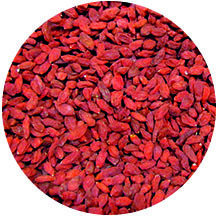 Goji berries are filled with powerful antioxidants and other compounds. Goji berries are also rich in vitamin A5. Dried Goji berries are eaten as a snack or added to juices, yogurts, cereals, meals, etc. Goji tea is very popular in China.